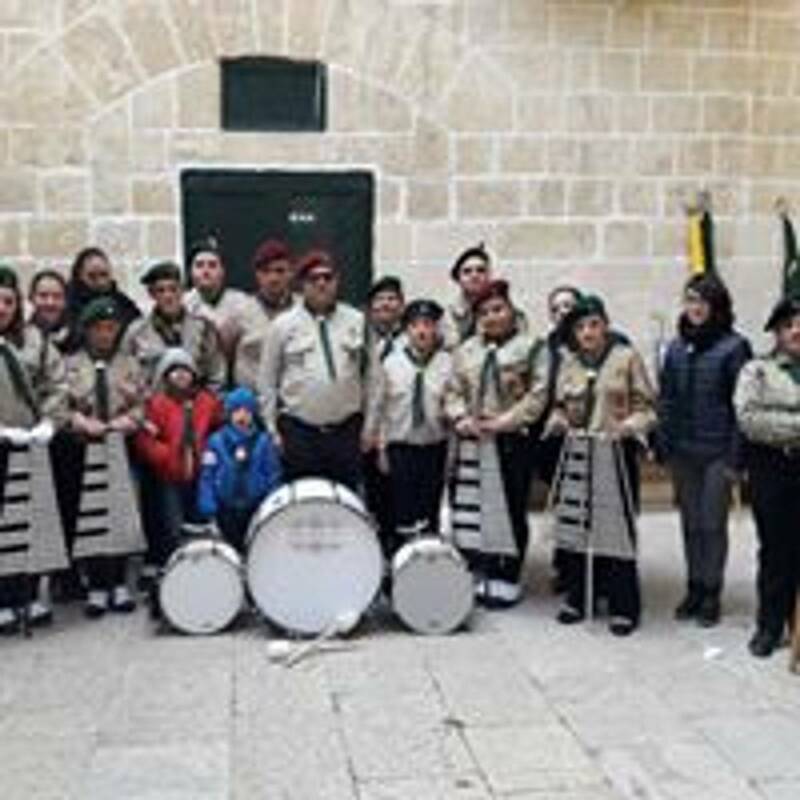 FEDERATION'S official scarfs AND BADEN POWELL SCOUTS GROUPS in MALTA official scarfs in use. 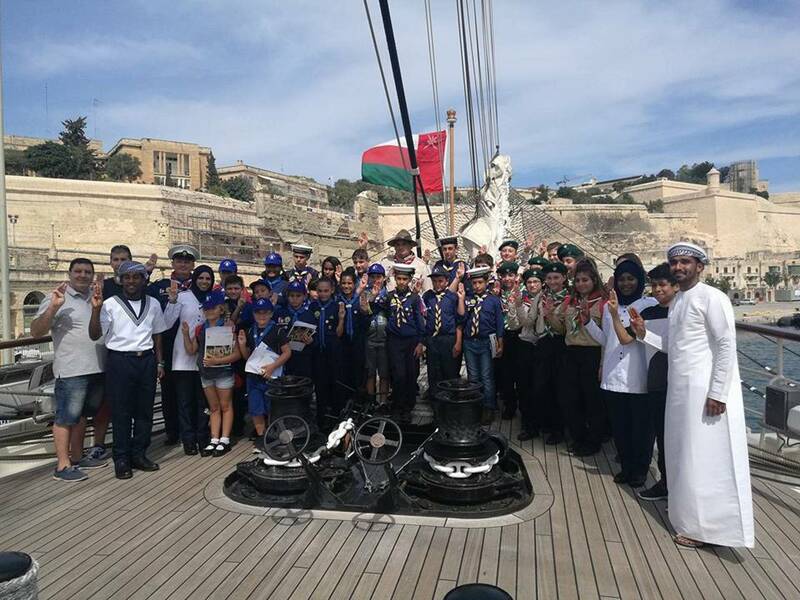 BADEN POWELL SCOUTS MALTA official scarf which is worn by scouts travelling abroad to other countries. The colours red and white represent the National Flag of Malta. The white eight pointed cross on a red background is the 'Civil Ensign' used on the Maltese Islands. 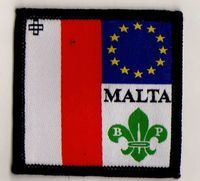 The National Flag of Malta on the right of the badge and on the top left the flag of the European Union. On the left bottom of the badge the fleur de lys in dark green with the letters B. & P. on the petals on each side. The word, 'MALTA' in block letters and in black are found on top of the fleur de lys. As at 3rd of December 2018, this badge is out of stock and a modified design is currently being made. National Badge worn on the right hand side of the uniform above the right hand pocket. Top part shows the Maltese Flag according to the protocol and the Constitution of Malta. 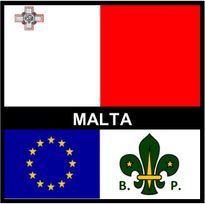 A black colour band rests between the National Flag and the flag of the European Union on the left hand bottom and on the right on a white back ground the scout fleur de lys on green with the five pointed stars on each petal symbolising the Traditional Scout Law with its 10 points. The letter 'B.' and 'P.' are found under the patels of the green fleur de lys. The letters stand for Baden Powell. 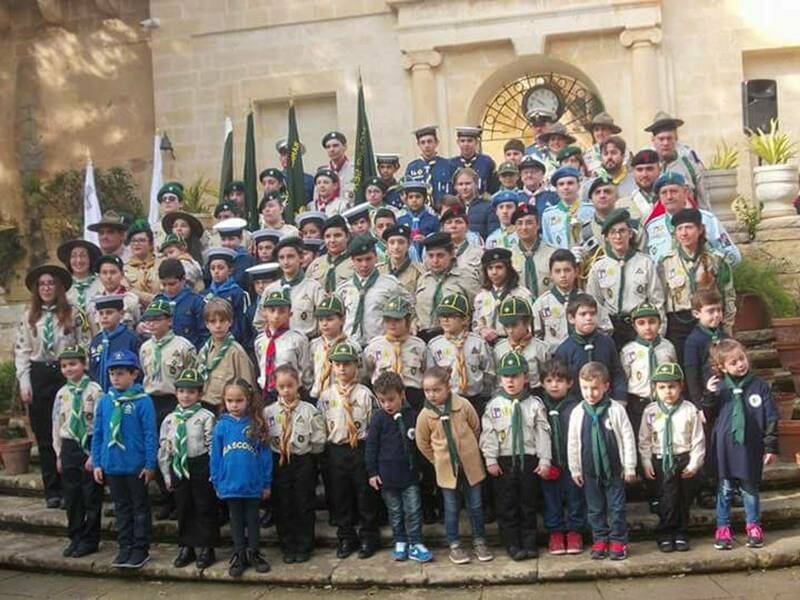 St. George's Day & Parade in Qormi in April 2014. 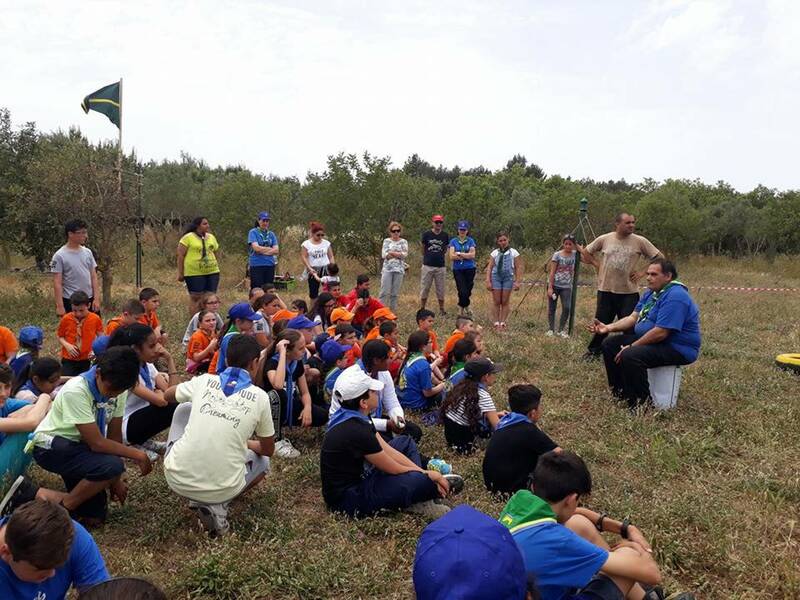 Participation with FSE Trapani 1, Madonna Del Carmine. 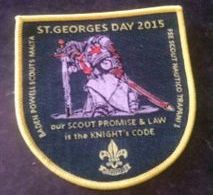 Badge for St George's Day & Parade 2015. BADEN POWELL SCOUTS MALTA official seal. It is based on an octagon shape trim. 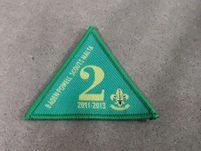 It has a dark green border on the inside along the edges with the words,'BADEN POWELL SCOUTS on the top half, a fluer de lys on each side at the middle and the word, 'MALTA' on the lower bottom. 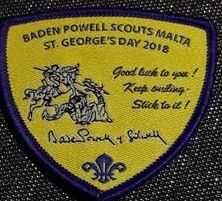 In the centre on a dark yellow background a picture showing St.George slay the dragon of evel, whom the Founder, Lord Baden Powell choose as the Patron Saint of all Scouts, for his qualities, for his courage and for always helping others in need. The badge has also a dark yellow trim on the edges. 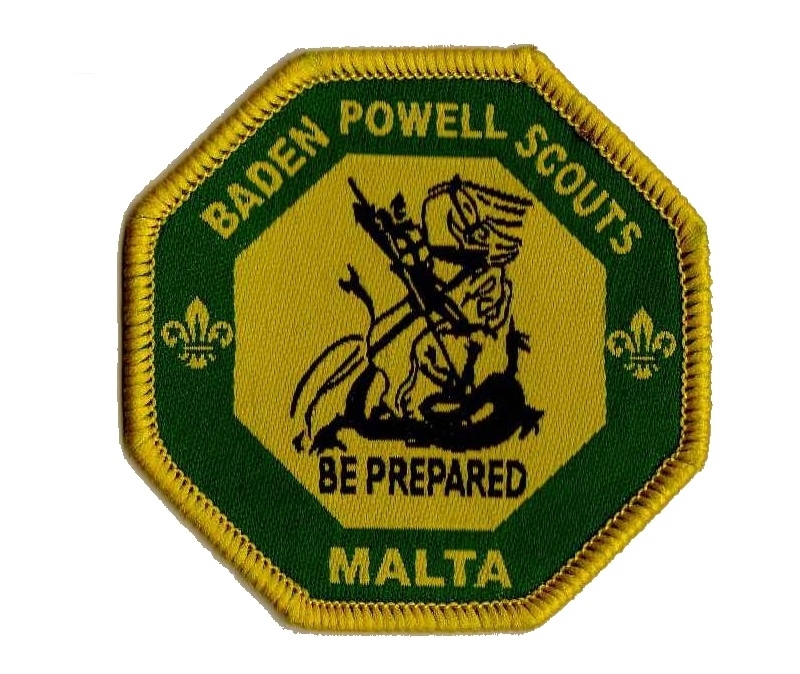 This badge was made in 2013 to commemorate the 2nd year since the Foundation of Baden Powell Scouts Malta in 2011. 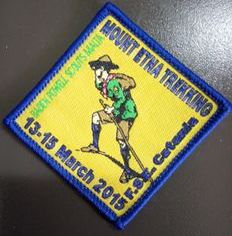 This badge was designed and made to commemorate a trekking journey on the the ice of ETNA and meeting with FSE SCOUT GROUPS in CATANIA, SICILY. Badge for St. George's Day & Parade 2018. 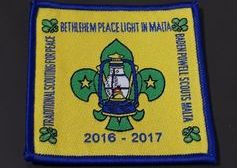 Bethlehem Peace Light in Malta 2016 - 2017.